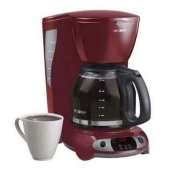 alaTest has collected and analyzed 11 reviews of Mr. Coffee TFX26 12-Cup Coffee Maker. The average rating for this product is 3.6/5, compared to an average rating of 4.4/5 for other products in the same category for all reviews. People really like the reliability and durability. The price and usability also get good reviews. We analyzed user and expert ratings, product age and more factors. Compared to other products in the same category the Mr. Coffee TFX26 12-Cup Coffee Maker is awarded an overall alaScore™ of 78/100 = Good quality. First of all I think it's beautiful (Red is my favorite color) Second the brand is one of my favorites I trust it, it's the best. Nice style, great design, good quality, I don't have to change the paper filter every day. It's perfect !!!!!! EZ Auto program wake up to fresh coffee! Loved the look, price was right, but really didn't last. I guess you get what you pay for. I would recommend as long as your not a heavy coffee drinker. Very easy to use and hassel free coffee making. I found this product to be a great addition to the kitchen and the nice design is very stylish too.